The Oxford Dictionary defines “atheism” as “Disbelief in the existence of a God”. The Buddha, although rejecting the idea of an all-powerful Creator, teaches that there are beings who live in the celestial realms. They are variously called angels, devas, spirits and gods by different cultures. As the Buddha also instructed these beings in the Dhamma, he is described as the “teacher of gods and men”. So can Buddhism be correctly labeled an atheistic system? Religious arguments often come down to the use of religious language. We must ascertain to what we are referring when we use the term “God”. If one who speaks of God is referring to a Creator, a wrathful, bearded old man who sits in the sky taking notes in his little black book ready for the day of judgement, then yes, Buddhism rejects this notion of God and may be considered atheistic. 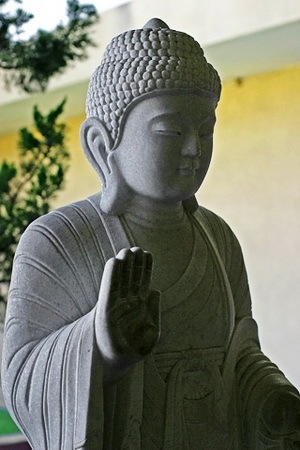 However, in saying Buddhism is atheistic, the answer requires further elaboration as the word “atheism”, like the word “godless”, frequently carries a number of disparaging overtones or implications, which in no way apply to the Buddha’s teaching. Those who use the word “atheism” often associate it with a materialistic doctrine that knows nothing higher than this world of the senses and the slight happiness it can bestow. Buddhism is nothing of that sort. It teaches that true and lasting happiness cannot be found in this world nor on any higher plane of existence, conceived as a heavenly or divine world, since all planes of existence are impermanent and thus incapable of giving lasting happiness. Instead, Buddhists have as their highest ideal the state of Nirvana, a state which totally transcends this world beyond conceptual thought. The Buddha calls it the highest bliss. Buddhists really do not care if there is a God. Whether he exists or not, it does not matter. For the Buddhist, his immediate problem are his personal problems; his suffering and he realises that prayer or supplication to a God, whether he exists or not, has not helped anybody in the past and will not help him. The Buddhist realises that he has within him the ability to overcome all his suffering and to do this he practises the teachings of the Buddha.